Just once, I would like to come out of a Steven Spielberg movie and think, “man what a hack. That movie sucked!” Nah, that will never happen. Even THE BFG could not dim Spielberg’s genius. THE BFG (Big Friendly Giant, lest you think it is something crude) was adapted by the late Melissa Mathison who also wrote E.T. It is Roald Dahl’s story of an orphan girl, Sophie, who is kidnapped by a Big Friendly Giant after she sees him sneaking around outside the orphanage where she lives. They go back to his home and have to deal with bigger Giants who love to eat children. BFG also catches dreams which he then stores and later shares during his nocturnal visits to London. Sophie comes up with a plan to enlist the help of the Queen of England and the British military to get rid of the man-eating Giants. Yeah, I can’t believe it either. Academy Award winner Mark Rylance is the voice and physical inspiration for BFG. 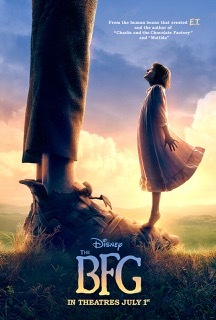 Newcomer Ruby Barnhill is Sophie, the little girl BFG kidnaps from an orphanage. Sophie inspires the giant to stand up to other children-eating giants. Downton Abbey’s Penelope Wilton (the Queen of England) and Rebecca Hall (the Queen’s assistant) also have small but pivotal roles. What impresses is not just the emotional core of the film, but the technical achievement in combining live action, CGI and motion capture and making it all work seamlessly. The movie has a fairy tale patina, but does not look cartoonish. You really feel immersed in the world, especially in 3D. I enjoyed the movie a lot, but I cannot get over this weird tale that Dahl wrote. How he takes a fantasy about Giants and drags modern military into the story. It is kind of jarring. This is a great movie for the kids. It is a little scary with stories of Giants eating children, but not too bad. And if you have seen FINDING DORY, this is a nice change of pace from Pixar’s formula. THE BFG is just a movie that makes you feel warm and happy. That is part of Spielberg’s special genius. He finds the emotional center of any story and focuses on that. He drags you in and holds you there to share the experience with the characters. That is why Spielberg is an all-time great filmmaker.